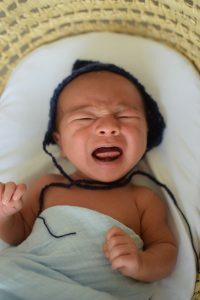 In honor of baby boy turning one month old, I wanted to share his birth story. 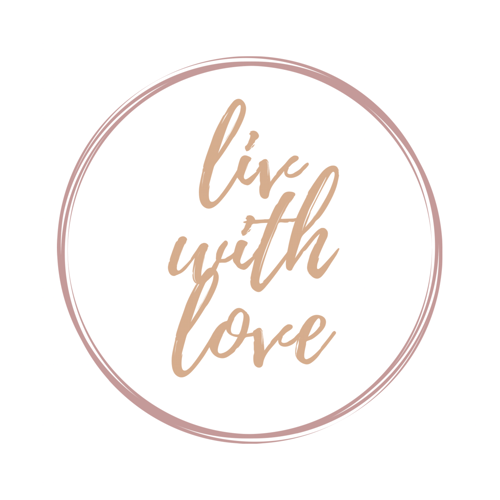 It is by far the most personal post I have ever written, but I really wanted to do it. The reason being: I am SUPER PROUD. I’m proud of my wife, my baby, and of course myself. 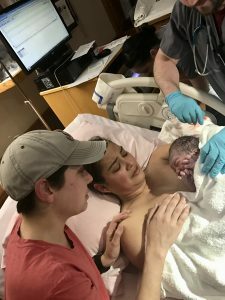 I knew I could do it (birth a baby that is), but I wasn’t sure I could do it. I wrote a birth plan, with plan A, B, and C. I had prepared for the best scenario and the worst scenario. I had no idea that I would be lucky enough to have nearly everything go according to plan A. 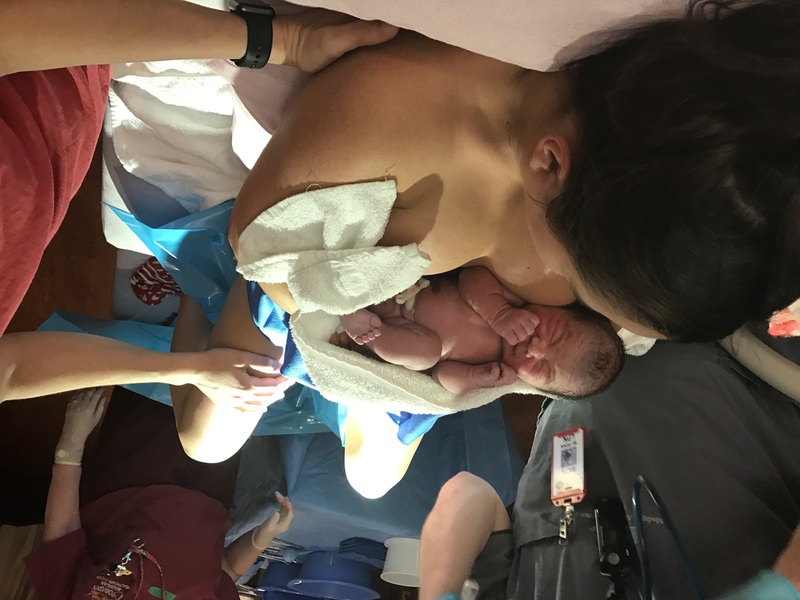 When people have asked how the birth went, besides the obvious pain factor, I had my ideal birth. 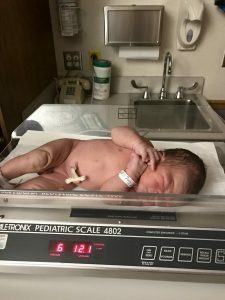 It was short, unmedicated, and I got a perfectly healthy baby. 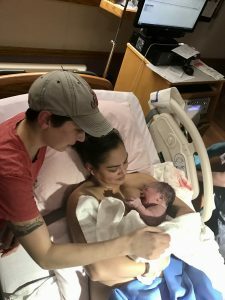 So without further ado, I give you an extremely thorough and long- winded (I spared little detail) birth story. 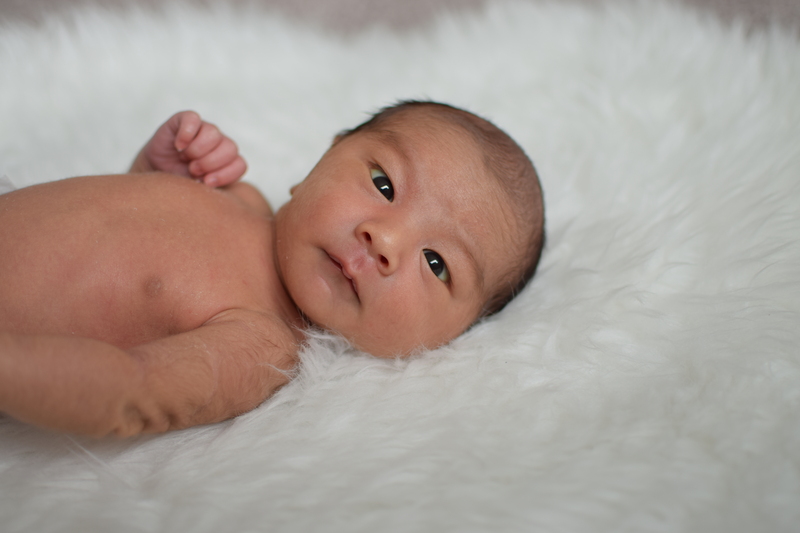 On Thursday, March 16th we went in for our 38 week appointment with our midwife. This was the one that I had been so excited about because I knew that if my cervix was dilated even to one centimeter that I could go ahead and get my membranes swept. This is where the midwife puts her finger in right past the cervix and does a sweeping motion. This is to separate the amniotic sac from the cervix, thus releasing prostaglandins- a hormone that stimulates contractions, and eventually labor. I was told that it is effective about 50% of the time. Looks like I was part of that 50%. 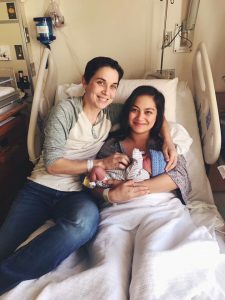 After midwife, Megan, finished sweeping, I was 2 centimeters dilated and 50% effaced. Within 6 hours I started cramping with some irregular contractions thrown in the mix. The next day I woke up and still felt the occasional contraction, but nothing consistent. We had purchased tickets for opening day of the new Beauty and the Beast movie. I had wanted to see this movie so bad. My whole pregnancy I joked, “He can come any time after the 17th. That way I can still see the movie in theatres!” I guess he took that request pretty seriously. After the movie we went to drop off some pottery at the Tacoma studio, and that is when I noticed that contractions were starting to feel more rhythmic. They were only 30-45 seconds long, with anywhere from 8-20 minutes between them. They kept me up a little throughout the night, but I was able to sleep some. I had thrown some pieces on that Friday and really wanted to trim them before Lucas came, so I remember going to bed thinking, “He can come right after I finish trimming my pots.” That night, I experienced more signs of impending labor (these details I WILL save for myself). 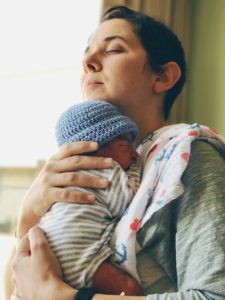 The next morning, I noticed contractions were closer together. But the pain was still just a 4 or 5. As I was trimming in the studio, I would have to stop to have a contraction: stand up, breath through it, then quickly get back to work before the next one came. Dayna was gone for the morning at Oakley’s vet appointment when I shot her a text saying “I think we should think about heading to the hospital” to which she replied, “I’ve been thinking that for days.” She headed home, we tidied up the house and ate a big breakfast of eggs, bacon, and toast, loaded the “go bags” (just in case), and headed out to Madigan. It was on this first car ride that I realized that I might be close to labor. 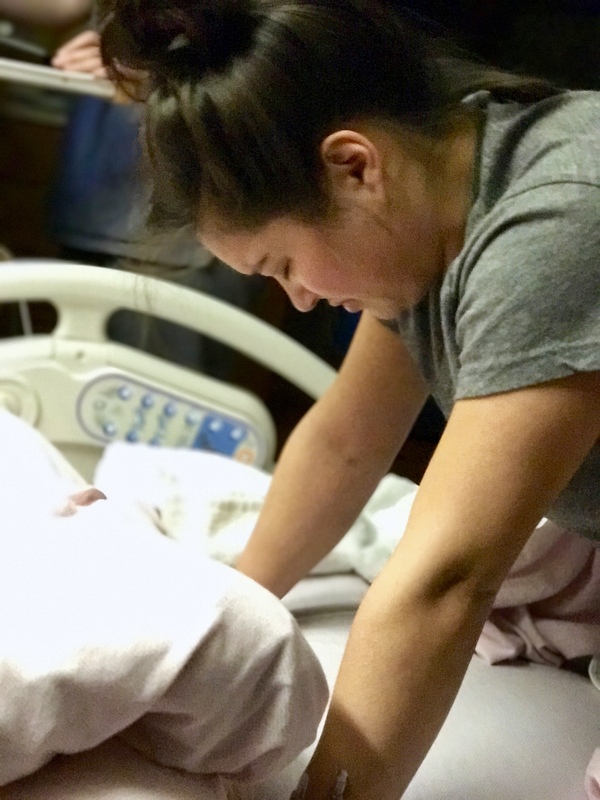 The contractions were in that 5-7 minute mark, lasting about 80 seconds each. The car ride was horrible. I couldn’t get into a soothing position and each contraction was heightened because of poor positioning. Getting out of the car I had to stop for a contraction. Once in the building I had to stop for a contraction. Checking into triage I had to stop and have a contraction. I was very curious to see how dilated I was. Madigan won’t admit you (if you are planning an unmedicated birth) unless you have reached 6 centimeters. I didn’t think I was there yet because when I was last checked on Thursday I was only at 2 AND in my opinion, contractions were still at a 5. I met my midwife that would be with us for the first half of our labor journey, Sara. She was amazing. A great spirit to be around and I felt instantly comfortable. She checked me and said “Wow! You are already 4 centimeters!” I was shocked. She followed that with “I’m going to go ahead and sweep [your membranes] while I’m up here”, which I’m sure is another reason that labor picked up. It was at this point that they wanted to look at Lucas with an ultrasound. They kept asking “And you’re sure your water hasn’t broke?” They wanted to take a look and see just how much amniotic fluid he had around him. It was sweet to see him that morning because we hadn’t had an ultrasound since 21 weeks. It was like he was giving me something to really look forward to- like a teaser. Sara showed me how his eye sockets were looking straight up at the ceiling. She said that was why I was having so much back labor. He was sunny side up. Essentially we were spine to spine. 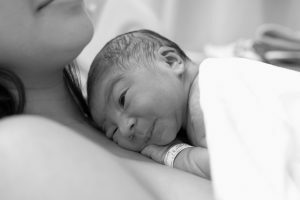 I flashed back to conversations that I had had with a close friend about her 56 hour labor and how no one had explained that her baby was sunny side up OR that there were maneuvers to help get baby to spin around (to which her whole labor ended in a cesarean). I was determined to go home and start spinning this baby. And with that, they sent me home to labor on my own for a few hours. I got in the tub. 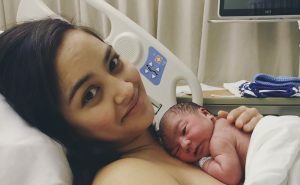 My whole pregnancy I thought that I would LOVE laboring in a tub. 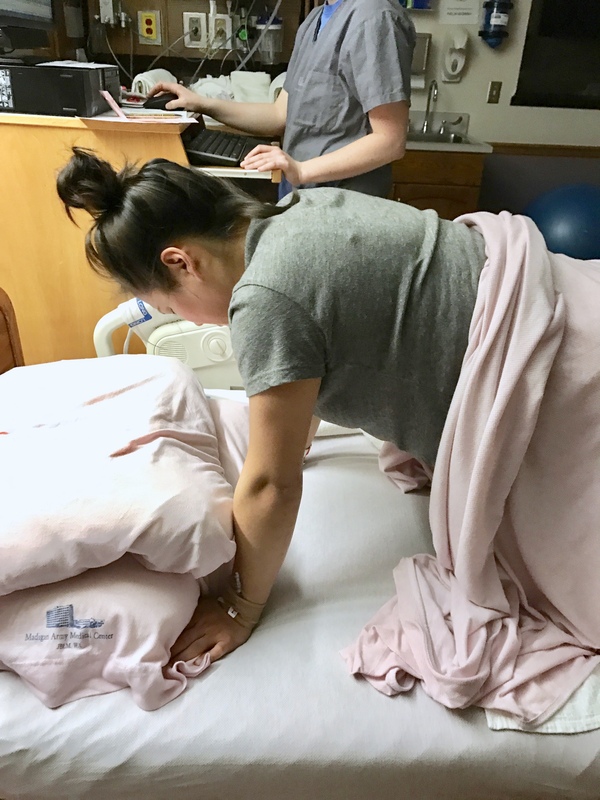 As it turned out, the only position that felt right during a contraction (from the start) was being on my hands and knees, or some position that took as much pressure off my spine as possible. That meant no laying down, definitely not resting on my back. I could if I was between contractions, but the second I felt one coming on (slow and steady like a train- you could see it coming from a distance, then it roared as it went by, finally slowly subsiding it’s noise as it carried onward), I HAD to assume a hands and knees combo. So in the end, the tub didn’t have as much appeal as it once did. We checked back in at Labor and Delivery at about 2pm, contracting along the way. 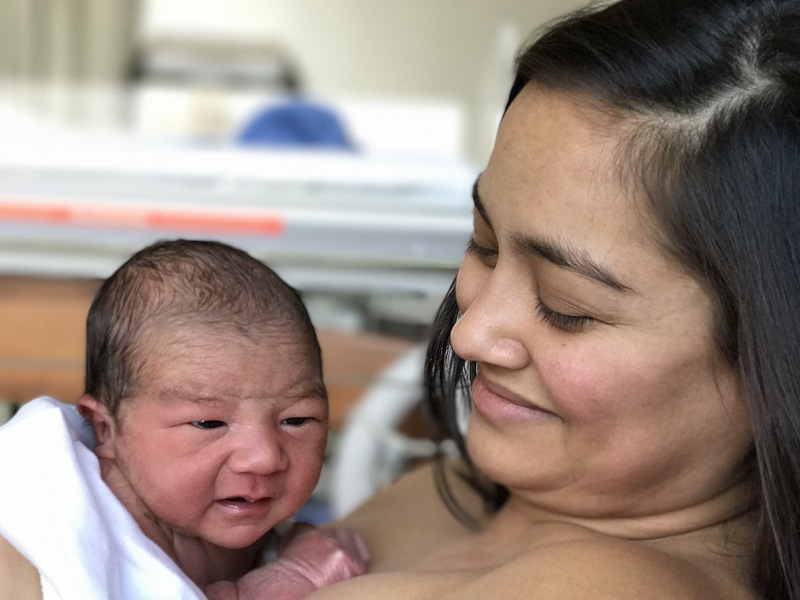 The nurse and midwife walked into our room as I was in the middle of a particularly nasty one. As I finished, I looked at them and said, “Ok, we’ve got three good minutes to get this done.” They laughed at my “go-getter” attitude and checked me quickly to find that I was indeed 6 centimeters. We were admitted and had the BEST room. It was huge yet cozy. We met our nursing team. One was Lucy. The sweetest, young, red-head (with some affected accent that I believe was Irish), who was determined to support our plan of a natural birth. Our second nurse was equally lovely, but I cannot recall her first name. Dayna swears the last name on her badge was Brown, so that is what we will go with. She was tall, blonde, soft spoken, and very calming to be around. It was about this time when we got settled in our room that I was starting to really draw inward. I had stopped talking unless absolutely necessary. Dayna had been given instructions to not ask me any questions, especially during a contraction. I also closed my eyes for the rest of my labor. I remember feeling so rude. These people were trying to help me and I wanted to remain non-verbal, close-eyed, and unbothered. They gave me a huge water bottle, which became Dayna’s purpose throughout labor. After each contraction, she held the bottle to my mouth and I took as many sips as I could. She also managed to get me to eat a popsicle. For a while it was contraction, water, popsicle, rest, and repeat. 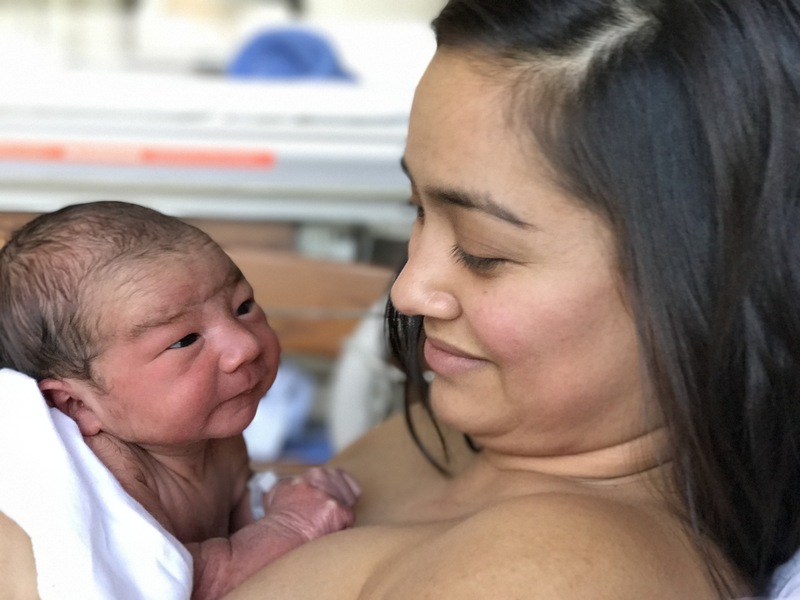 The nurses went over my birth plan and said all looked well, and they started the process of my saline lock, which was very uncomfortable and bruised and looked horrible by the time I gave birth. They never even had to use it. They did intermittent fetal monitoring, which was kind of a pain. 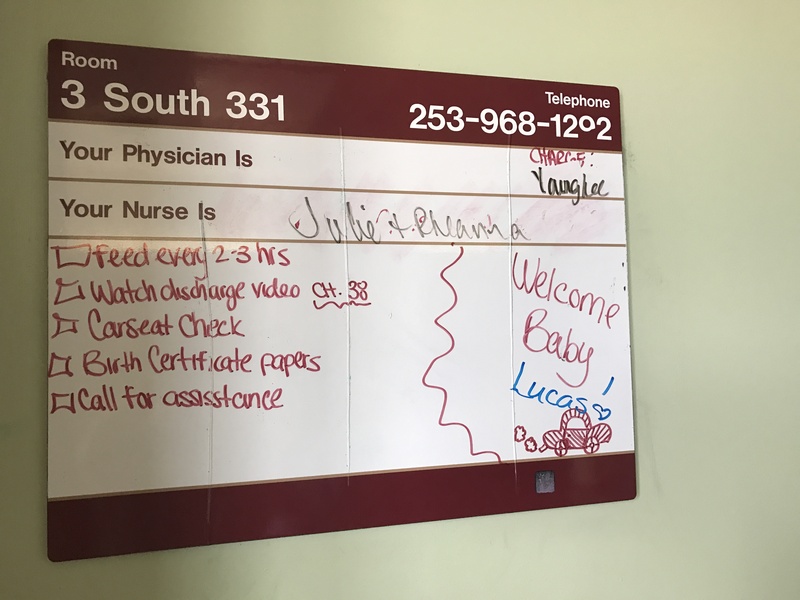 They had to listen to hear how Lucas was responding to each contraction, and he reacted just how he was supposed to throughout. However, getting that Doppler right up against my aching uterus was not very comfortable. I mostly didn’t want to be touched. While I wasn’t allowed any food, Dayna needed sustenance. Even though she didn’t want to leave my side, I told her that I would need her to keep her energy up till the end. As she was grabbing dinner at the cafeteria, midwife Sara kept me company. She asked if I had taken any birthing classes. When I told her I hadn’t, she said that was surprising because I was exhibiting characteristics of hypnobirthing. I took that as a compliment. In my exhausted state, I told Sara that I was sure that I could do this, but that I wasn’t sure that I could do this. She told me that my fears were normal and that every mom has this thought at some point in labor, and that usually meant that the end wasn’t far. The nurses and midwives had shift change at 7:30. This was bitter sweet because I felt like I had just labored for 5 hours with the team that I thought would deliver my baby. But now they wouldn’t get to meet him. 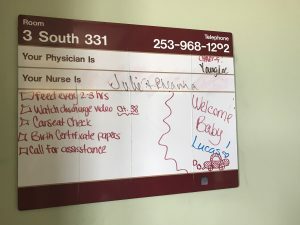 My nurse Lucy ran out of the room to try and “snag me a good nurse.” She said she had one in mind that had a real passion for unmedicated births and she had delivered her last four babies in a row in this very same room “au natural.” We got her! I had to use the restroom many times during labor. I had gotten up to pee when my new nursing team came to meet me. They got to witness one of my worse contractions. It was most likely two back to back. This scene stuck in my head for some reason. Here I was, eyes closed and non-verbal- as I had been since about two o’clock- standing in the bathroom in my hospital issued undies, gripping the hand rails, moaning through the longest contraction yet. “Nice to meet you,” I thought. My new nurses were Alison (the natural birth enthusiast) and Stevie, along with my new midwife, Barb. Even though this team was with me for less time, I felt like the bond was just as strong because they got to witness my labor when I entered transition and then of course the birth. By shift change at 7:30 pm, I was completely exhausted. My contractions were one on top of eachother, and I was still only able to labor in the plank position, so my arms and legs were Jell-O, and would NOT stop trembling. I was sweating, but I was cold. 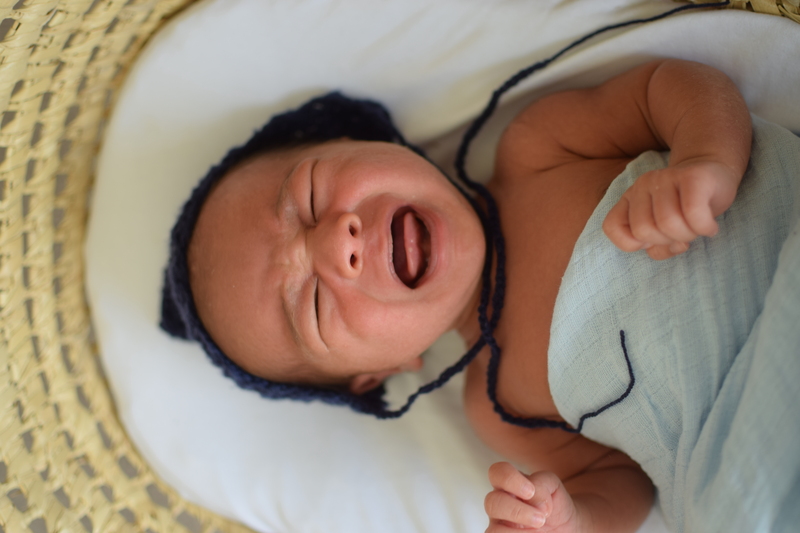 At one point, my temperature started to rise, which was just one more thing to monitor. At some point, Alison and Dayna helped me out of my bottoms. I remember thinking that I could not handle much more of this. All I could focus on was the pain. 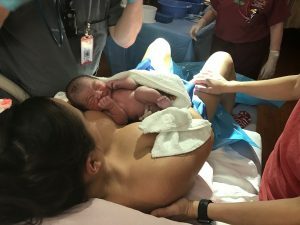 For any of you moms and moms-to-be, it was at this point that I was cursing legendary midwife, Ina May and her idealistic natural birth expectations. I continued to ride my contractions for a while longer. I knew that I could push, but at this point, I didn’t have the urge yet. Then it happened. I was groaning through a contraction when I suddenly felt an unexpected urge to bear down. And it totally scared me. “I feel like I want to push! !” I yelled. The nurses paged my midwife and she came back to observe me. The first few pushes felt really unproductive. I was grunting and yelling and pushing as hard as I could with what little energy I had left. One of the nurses had a suggestion that really helped me. She said that instead of releasing all my energy upward and outward when I yelled, that instead I try pushing it downward to help me push more effectively. It was with a few more of these pushes that really got Lucas moving downward quickly. This is where I feel like I remember entering transition. I had been pushing with my contractions, not even every contraction. Pushing was taking all the energy I had left and unless I felt a real urge to push, I would wait. When my urges became more spontaneous, THAT is when I felt like I had entered transition. 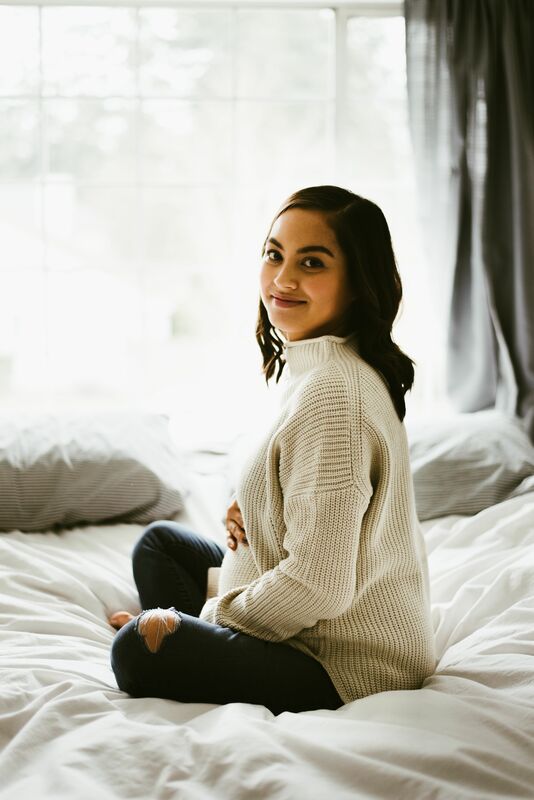 My body was doing whatever nature intended, and my mind was focused on “Open up, get him out.” I was no longer timing my pushing based on contractions, now it was just out of nowhere I had to push. I remember asking between pushes “Can you see anything? Am I making any progress?” To which everyone just responded with, “No. Not yet. But you are moving him in the right direction.” And then, during a good sized push, I heard and felt a snap! To which Barb said, “Oh, your water broke!” (however there was not a lot of water present because he was already so low that his head blocked the exit) And shortly after she exclaimed “I see hair!” That made my insides light up. If she sees hair, that means he’s right there. This could all be over so soon. I’m at the finish line. Barb decides that she should probably take off her fleece pullover at this point, and turns around to do so. I happened to push right at that moment, and it happened to be the push. Alison shouts to Barb, “HEAD!” Barb turns to look as Lucas emerges and Alison shouts out again “BABY!” and she and Barb dive to catch our son and I ease him out in one long push (also emerged the rest of my water). The next part is a little blurry. I delivered him on my hands and knees (surprise surprise) and remember looking down between my legs and seeing my baby. I heard his cry. I heard the nurses and midwife saying “Olivia, you can pick up your baby.” Then they realized that I was pretty much paralyzed with achy muscles and also not wanting to move because I was still attached to his very short umbilical cord. They quickly helped me turn over to my back and placed the softest most beautiful bundle of baby on my chest. I looked to Dayna who was crying. I was crying. Our baby was here. He was perfect. And I was exhausted. … Now cue a bunch of photos of my double chin. In my defense, I was 9 months pregnant and retaining a lot of fluid! I still think they’re beautiful. 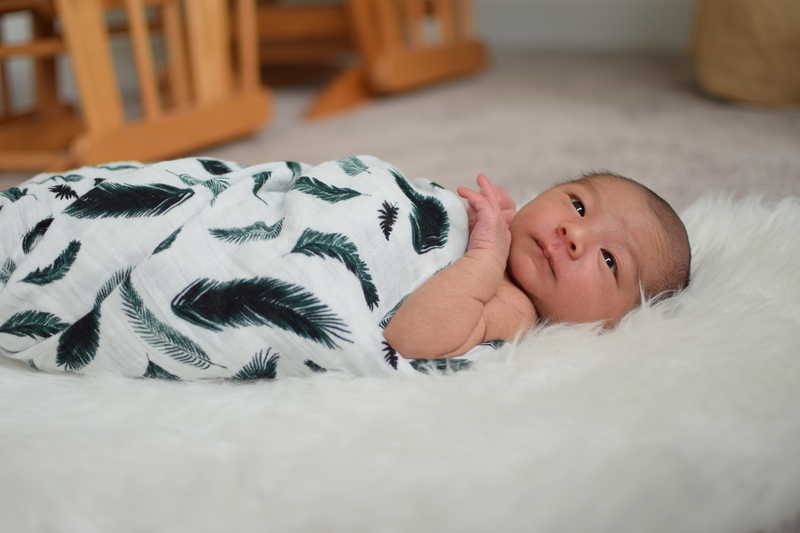 And just like that, we are one month old. So in love.